Our Pastor, Rev. Terrence Kissell. Fr. Terry, as he is known, was born in 1951 in Denver, Colorado, the son of Joseph and Mary Kissell (both deceased). He has two sisters and three brothers, two of whom reside in Colorado, as well as a number of nieces, nephews and grandnephews! Fr. Terry graduated from St. Francis De Sales High School in Denver in 1969 and received his BA from Metropolitan State College where he majored in psychology, speech pathology, and audiology. He is a graduate of the University of Colorado – Denver campus where he earned an MBA. He studied for the priesthood at St. Thomas Seminary in Denver and was ordained as a priest on June 3, 1978. He has served as pastor or as an assistant, at a number of churches in the Archdiocese of Denver. Previously, Fr. Terry was the Pastor at Our Lady Mother of the Church in Commerce City for 13 years. His administrative experience helped the financial position and beautification of the parish, including the installation of their beautiful stained glass window and the remodeling of the Church Sanctuary. Fr. Terry demonstrated a wonderful gift in working with the youth of Our Lady Mother of the Church parish, preparing them spiritually for their sacraments, involving them in community service projects and community events, and helping them to grow in their faith. He has a love of music, plays the guitar and the piano, and enjoys composing music for both instruments. He has recorded many CD’s and enjoys sharing his music with family and friends. He is fluent in Spanish and, although he began his study of the language in Colorado, he lived and studied in Mexico where he truly learned the language and the culture. In either language – English or Spanish – Fr. Terry is articulate and well- spoken and he believes in the positive power of open communication with the members of the parishes that he serves. Fr. Terry is serving as the Dean of the “East Deanery”. Fr. Mauricio Bermudez-Hernandez was born in Puebla City, Puebla. Mexico on June 3rd, 1979. He is the youngest of two kids, and is left-handed. He also has some food sensitivities and allergies.Fr. Mau went to College at Universidad Popular Autonoma del Estado de Puebla (UPAEP), and studied Theology at St. John Vianney Seminary in Denver, CO. 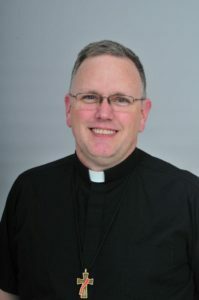 He has a certification on Bioethics by the National Catholic Bioethics Center in Philadelphia and is currently enrolled at the Spiritual Directors Program at the Institute for Priestly Formation. Fr. Mau has a huge devotion to the Most Sacred Heart of Jesus, to our Lady of Mt. Carmel, to Padre Pio and to St. Therese of Lisieux. Deacon Tony was ordained in June 2005 and currently serves St. Michael the Archangel. He and his wife, Mary Ann, are founding members of the St. Michael parish community. Married for 49 years, they are the proud parents of seven children and 17 grandchildren. Deacon Craig was born and raised in Connecticut by Italian immigrants from Naples, Italy. He was ordained as a Deacon in 1990 by Cardinal Roger Mahony at the Cathedral in Los Angeles. He moved to Colorado in 1992 with his wife and son. Previous assignments in Denver include St. Francis Cabrini Parish in Littleton and then St. Mary’s Parish, also in Littleton. Deacon Craig enjoyed a 30-year career in banking, including 10 years at U.S. Bank in Denver as a District Operations Manager overseeing 23 local branches. Deacon Craig is a deacon at Buckley AFB and helps with the Catholic Mass and religious education. Deacon Wilfredo (Willie) Liwanag was ordained in May 2007. He Moved to Colorado in 1978. Former members of Queen of Peace Church and founding members of the “Bayanihan Society of Queen of Peace” (a small faith community of Filipinos) in 1983. Married to his wife, Lourdes Tan, for 36 years, two sons, a daughter and two grandchildren. Retired from CH2M Hill as a Lead Piping Mechanical Designer. Deacon Christopher Martin Pomrening was ordained on June 25, 2011 in the Cathedral Basilica of the Immaculate Conception in Denver. He and his wife, Guadalupe have five children and two grandchildren. He is a branch manager for the CR Laurence Co., Inc. Deacon Pomrening was attracted to the diaconate when he saw a group of men who had dedicated their lives to something so much larger than themselves and what outstanding people they were. They became a model of Christ that he could relate to because of the great commonality of experience that they shared. He also had a strong sense of being called to the diaconate through teaching religious education to high school age young people. Deacon Pomrening also is a licensed pilot and a certified flight instructor. Deacon Greg was ordained in June of 2017. He and his wife Amber have been married since June of 2000 and live in Aurora with their six children. He is an Operations Manager for a construction engineering company in Centennial and currently is serving the Heather Gardens and St. Michael the Archangel communities in his ministry. His road to the Diaconate began when a permanent deacon prepared him and Amber for the baptism of their oldest daughter. Most of the staff photographs are compliments of Bettinger Photography.